The text in the eBook is at a beginner-intermediate level. So if you are comfortable with the level of the Beginner readings available free on our website in the Beginner Practice Readings section, then you should find this text very helpful. An eBook in PDF format (18 pages) containing: 3 beginner readings, as well as grammar and question and answer sections after each reading, which you can print at your own convenience. Everything including the explanation of the grammar is translated into English. 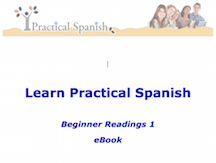 Recordings of all the Spanish in the eBook are in mp3 format for you to listen to on your computer, load onto your mp3 player or burn onto a CD. 2 sets of recordings: One is recorded at a slow pace to make it easier for you to understand, and the second recorded at normal conversational speed for you to develop your listening comprehension once you are familiar with the text. The text uses conversational Spanish as it is spoken in Latin America. There will always be slight differences from country to country but we have tried to keep the Spanish as close as possible to the standard Spanish spoken all over Central and South America.